Our heroes remain trapped within the Cité de L'amour. Much brawling ensues. 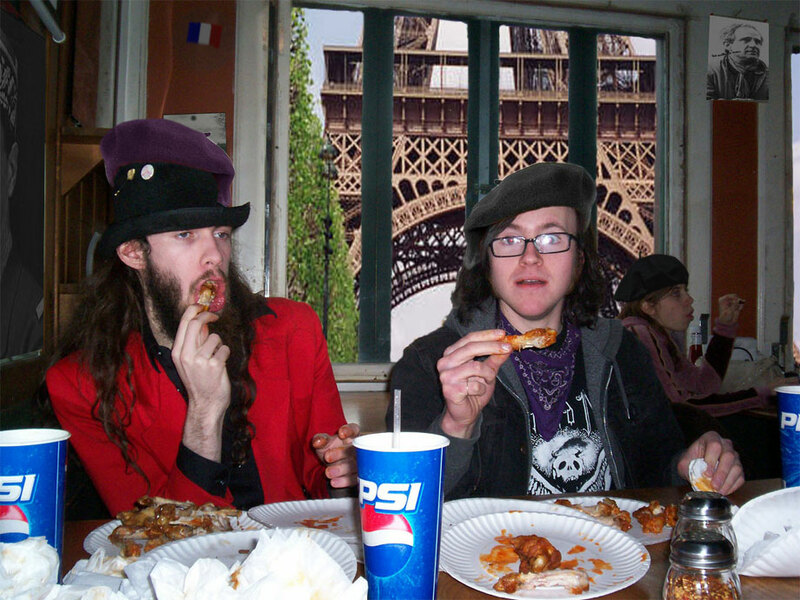 Elite Zombie Hunters The Mad Hatter and Peter “Texas Dynamite” Fury enjoy Le Wings at a swank Parisian café. This would be the last time that they would eat proper food in two months. Yes, even though it was last year that the ZOMBIEAPOCALYPSE reached its devastating crescendo and the myriad employees of Jim Rage’s Elite Zombie Hunting Squadron dropped-kicked the Church of Living Death into righteous oblivion, they still have been unable to leave the city of Paris. Multiple factors have resulted in this regrettable state of affairs: cash flow difficulties due to people not buying enough JREZHS merchandise coupled with expensive plane tickets, the Mad Hatter having a laconic expression on his passport photo, the gaping void in leadership that appeared after Ben “Paul” Parazinski left for Africa, and general inability on the part of most everyone to speak French. Brock Ironside has been especially hard hit, as in Paris there are no manly motorcycles to light on fire and only mere mopeds and mini-bikes. Currently they are trying to earn some Euros by performing freelance ghoul-extermination services/ house safety appraisal around Montmartre and engaging in illegal street-fights with a colorful array of multi-national fighters. They have also been creating training videos to be uploaded to the site at some point in the shadowy future. Bullet Man has quite possibly been getting along best as he currently found a temporary position as a human bullet. Additionally in their free time they are doing the art direction for a children’s television program called Amusement Avec Des Marionnettes. But fear not, friends and colleagues! If there’s one thing that’s kept the zombie-hunters going day and night, it’s a that All-American Can-Do attitude, and those at JREZHS remain certain that some random encounter with a person with precisely the right personal connections and wealth will result in a Voyage Home and massive-upgrade to the business. Keep those french-fries hot, for they’ll be back ASAP!